When created in 1922, Ateliers RIPPES first specialised in the design of welding equipment but then gradually acquired a significant amount of knowledge applicable to gas-operated equipment. In 1975, when heat-shrinkable plastics appeared, the company developed a gun powered by LPG or natural gas to shrink packaging covers produced using this new material. The RIPACK brand was created as a result. 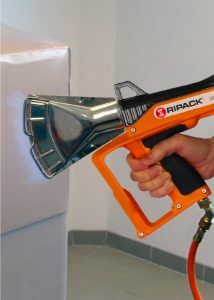 The patented “cold nozzle” technology which removes any risk of burning through contact enabled RIPACK to become the world leader in this market. The quality of the flame and the safety of the products, which proved to be a tremendous success in the market, is applicable to other applications such as plastic trimming or flaming, road marking and thermal weed control. The “Labbé” law passed on 8 February 2014 which prohibited the use of phytosanitary products under certain conditions by public entities and individuals naturally led the company to put forward an innovative thermal weeding solution by creating a dedicated division called “RIPAGREEN®”. Forever investing in research and development, RIPACK guarantees to provide its users with innovative products suited to their applications.